Even as the sun spread warmth today, cold wave claimed four lives in western UP district today taking the death toll to 18 in the last four days out of which 12 are from Meerut district alone, official sources said. Two persons died in Bijnore district while two in Bulandshahr in the current spell of cold lashing the entire northern region. The movement of rail and road traffic was once again badly affected by the dense fog and chilly weather conditions today. According to a report, almost all the long-distance trains running on the Delhi-Ambala-Kalka section were delayed. Most of the trains were behind schedule by three to six hours. The Haryana Government has earmarked a sum of Rs 319.46 crore during the current financial year for bricklining the water courses in the state so that water could be made available to the tail-end villages. Besides, efforts were also being made to provide sufficient power to the people in the state. Taking credit for an encounter that was not! Examinees: To party or not to party? Instead of cramming the ways to balance chemical equations, 15-year-old Dhruv is devising the ways to balance his “severely affected social life” and the “sermons from his parents and his conscience”. The Delhi Government’s proposal to stagger the weekly closing day of various wholesale markets in the walled city has met with stiff resistance from the traders associations. A 75-year-old woman was found dead with her hands and legs tied at her house in the Jungpura area of South district this afternoon. The victim Kaushalya Kanal, wife of K K Kanal, came back from Chicago 15 days back after visiting her family there. Treating a letter written by an old couple alleging atrocities by their son and daughter-in-law as a PIL, the Delhi High Court has directed the police to provide protection to the senior citizens. 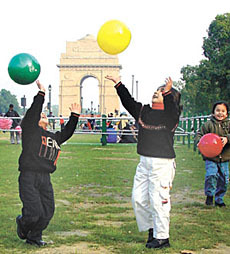 The year 2003 was a mixed one for the Panipat Municipal Council (MC). Even as it had a number of achievements to its credits, it fell short of the expectation of the common man. From the very beginning of the year, it remained embroiled in controversy, particularly related to corruption charges against it officials and contractors. Mr Inderjit Singh, Principal, S. Amar Singh Sher-I-Punjab Pindai Gheb Khalsa Senior Secondary School, receives the prestigious World Human Rights Promotion Award-2003 in the Capital. Senior BJP leader and member of Parliament from South Delhi Vijay Kumar Malhotra today appealed to Information and Broadcasting Minister Ravi Shankar Prasad to postpone the implementation of Conditional Access System (CAS) in the Capital by one year. He also asked for the reconsideration of the whole issue to make it consumer-friendly. Haryana is at number two position in the country in the cases of atrocities on Dalits whereas Bihar is at the top and Punjab has been rated at third position. This was stated by the Vice-Chairman of the National Commission for Scheduled Castes and Scheduled Tribes, Mr Lama C. Jotpa. The ongoing commercialisation of education and its set up had led to ‘dangerous dimensions’ detrimental to the subject itself and the society as a whole. If it was not checked, the education would become not only as inaccessible to the common man but the definition and parameters of the education will be defined by the people selling it as a commodity. The Haryana Chief Minister, Mr Om Prakash Chautala, concluded his two-day tour of nearly four dozen villages of Rohat Assembly constituency in Sonepat district last evening. Even while trying to understand the problems of the people of the region, he reminded them of the development works undertaken by his government during the last four years. IN most of the developed countries, like the United States, England and Canada, hospital management is the most sought-after career after information technology, opines Chief Manager, Corporate Relations of the Noida-based Kailash Hospital and Heart Institute, D. K. Chopra. In a conversation with Nalini Ranjan, he talked about various aspects on hospital management. The Haryana unit of the Bharatiya Kisan Union (Khokhar Group) has decided to form a coordination committee of 16 kisan organisations to oppose the anti-farmers policies of the state government. The farmer’s union also decided to form a new party, “Swatantra Bharat Party”, and contest the coming Lok Sabha and Assembly elections under its banner. This decision was taken in a state level daylong meeting of various farmer organisations here on Sunday. The Delhi Urban Development and Finance Minister, Dr Ashok Kumar Walia, has demanded the early regularisation of all unauthorised colonies so that basic amenities like water, electricity, roads, drainage could be provided in order to have a balanced development of the Capital. With the arrest of five Bangladeshi dacoits, the Crime Branch claimed to have foiled a dacoity bid near the Western Yamuna Canal adjacent to Canal Rest House in Samaipur Badli in North-West Delhi. The Crime Branch of the Delhi Police arrested one person and seized a banned tiger skin from his possession in the parking area of Palam Airport. Based on a secret information that a person was trying to sell a tiger skin, the sleuths arrested one Ganga Ram (40), resident of Chandra Vihar, Nilothi. The Mayor, Mr Ashok Kumar Jain, today laid foundation stones of two primary school buildings at Subhash Park and Janta Mazdoor Colony Zafrabad Extension in Shahadra Zone. A stylish half century by Sahil Kher and deadly bowling by Tausheef Ahmad (4 for 13) helped National Stadium Cricket Centre defeat hosts Nehru Public School by 24 runs in the inaugural match of the Nehru Public School Under-15 Cricket Tournament at the Jawaharlal Nehru Stadium. Bangladesh pipped India A by eight wickets in the Commonwealth Cricket Championship at the Tau Devilal Cricket Stadium at Gurgaon. 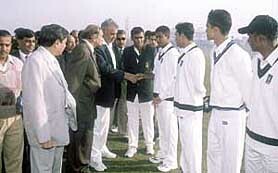 Haryana Vidhan Sabha Deputy Speaker Gopichand Gehlot spins the toss before the opening match of the Commonwealth Under-19 Cricket Championship at the Devi Lal Stadium, Gurgaon on Monday. Former Asian Under-10 champion Parimarjan Negi of Delhi annexed the National Under-11 Chess Championship when he defeated Shubham Pinge of Goa in the 11th and final round at the Bapu Samaj Sewa Kendra in New Delhi on Monday. 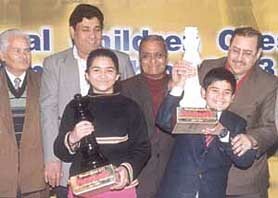 Parimarjan Negi and Devangi Patankar being felicitated by Bharat Chauhan, Sunit Sachar and Jhunjhunwala for their title wins in the National Under-11 Chess Championship at the Bapu Samaj Sewa Kendra in the Capital on Monday. A deadly bowling spell of 5 for 28 by Amarjeet Singh and a useful knock of 41 by Kunal Dalal helped Najafgarh Sports Club defeat UK Cricket World by six wickets in the fifth R G Williams Memorial Under-15 Cricket Tournament at the Frank Anthony School ground. An all-round display by skipper Tarun Choudhary (3 for 33 and 35) and a sprightly knock of 46 by Yogesh Nagar helped Delhi defeat Chandigarh by six wickets in the final of the Vinoo Mankad Under-16 Cricket Tournament at the Bharat Nagar ground.